- 8 tableau piles (below foundations) - build down by alternate color. Move groups of cards regardless of any sequence. 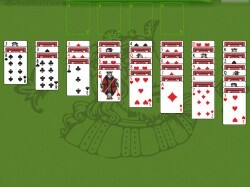 Fill spaces with Kings or groups of cards headed by a King. At the start of the game 3 cards are dealt to the first pile, 4 cards to the 2nd pile, and so on. The top card is face up, others - alternating face down and face up.